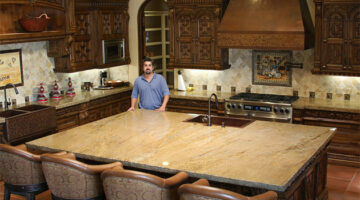 Are you considering using granite for your kitchen countertops and/or bathroom countertops? Here, homeowners are sharing their best tips for buying, sealing, and caring for granite countertops. 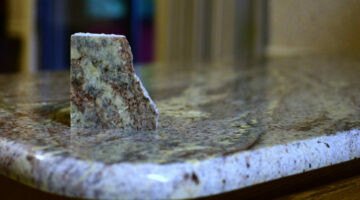 Wondering if you should use a granite sealer on your countertops? The short answer is: Yes! I’ll help you determine if your countertops need sealed right now or if you can wait awhile, whether to use a topical sealer or an impregnator sealer, how to seal granite countertops yourself, and how to remove stains from granite. Where Do Granite Slabs For Countertops Come From? How Is Granite Made? I’ve Seen The Process Firsthand! Where does granite come from? How is granite made? The process of bringing Mother Nature’s art to market is complex — and I’ve seen it firsthand. Here’s what I’ve learned about the process of mining granite slabs and preparing granite slabs for sale in stores. You’ll never look at granite kitchen countertops the same way again! I have found the best granite countertop paint. Your friends won’t believe it isn’t actually stone. If you’ve been looking for an awesome kitchen countertop paint to transform your hum-drum counters, you need to follow these tips. Here’s how to paint countertops with a granite paint kit to update old, ugly counters to look like granite. It’s the next best thing to granite but at a mere fraction of the cost of granite countertops. Painting countertops might seem a little weird but if you want the look of granite without the cost of granite, take a look at this. 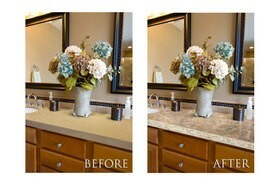 This is a great solution to a dull and dated countertop. It’s durable and will last as long as the countertop you paint it onto. It’s a DIY money-saver, too.